A Houston Lesson – Be “One” & “Someone” To A Happy Retirement. A version of this writing appeared on MarketWatch. There’s a controversy brewing in Houston. The conflict between the “one” and the “someone,” is highly visible, to thousands of commuters to see. 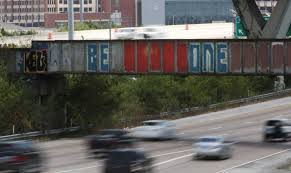 Painted on the side of an overpass, for as long as I can remember, at least 17 years, those heading south on a bustling freeway have grown accustomed to the weather-worn message. Between ominous rusted-steel teeth at the mouth to downtown, I find myself looking for it, expecting the usual sight of what has become a faded element of the urban landscape. I laugh to myself every time I pass. Why do I care? Is it tradition? Beacon? Wisdom? No idea. I think -Who shall I be today? Can my identity stand the elements and test of time? Will my integrity allow me to remain or be someone? An unidentified culprit painted over, messed with the message. A word that completely changed the tone was gone. No longer was I someone. A vandal’s vandalism of vandalism merged me into life’s traffic? Houston’s road congestion is bad enough, now this, too. I wasn’t the only one disrupted by the alteration. There was local news coverage. Television, radio, print. Then, as quickly as media attention emerged, an urban hero yet to be named, wronged a graffiti right. 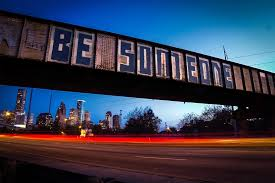 In fresh paint, “BE SOMEONE” was back. The message in the infrastructure had returned. The best way to avoid surprises and maximize life in retirement, is to hit the gas. A “BE SOMEONE” mindset is you as you stand apart from others. A “BE ONE” frame of reference arises as you stand together as a share of a greater whole. Be Someone: Retirement is the opportunity to re-awaken your true identity, rekindle inner passions. Relish the time to march to your own beat, again. This is no bucket exercise. A bucket list is compiled of grandiose experiences, at least in my opinion. A re-acquaintance list is small in comparison yet ongoing. Like a support bridge underfoot that hasn’t been traveled completely – It’s what makes/made “you” well, “you.” It’s a return to simple passions that lead to greatness which I define as joy and richness of soul. The relevance of career goals fade. Greatness is achieved through less monumental actions which occupy slow whispers of time. It’s when the greatness of “be someone” is realized. For retirees, it’s a return to desires they needed to place on the backburner to earn a living, like reading or painting. Also, they’re seeking educational and lifestyle enrichment by selecting retirement residences that exist on college campuses. For example, The Forest at Duke University offers apartments and single-family homes in a 40,000 square-foot independent wellness community. There is access to private primary care or skilled nursing in a lush, tranquil setting. What retirees find most attractive about these communities is the chance to fully embark on the “be someone” concept. The Forest offers lifelong learning through regular in-house programs like lectures and resources by local scholars. In addition, the initiative to nourish the mind, body and spirit is appealing with access to performing arts, ballet, yoga and guided mediation. Residences may be apartments or single-family homes for an entry payment and a monthly service fee which is inclusive of all living expenses including meals. Be One: To “be one” is to be a participant in something bigger. Here, your identity is at its best when part of a greater mission. People who remain engaged with former co-workers, provide deep experience into current projects, and participate in weekly or monthly rituals with friends or those in their communities appear most fulfilled through retirement. An engineer who retired in 1996 still meets his high school buddies for dinner once a month on Thursdays. The members of this group have never missed a date. Unfortunately, several have passed. However, that hasn’t stopped the ritual. In 2010, a project manager known for her skills to assemble an effective team accepted a severance package from a large pharmaceutical company. She still mentors and continues friendships with those she hired throughout a 24-year tenure. Active retirees are involved in coffee groups. Regular meetings of people who bond over hot coffee and highly-caffeinated morning conversation. From Perry, Iowa to Hartwick, New York, these gatherings have been in existence close to a decade and contribute to mental acuity through community, support, active listening and verbal engagement. There’s no room for technology like smartphones or tablets, either. Be Someone: March to your own drummer, walk the path that brokerage firms purposely choose to ignore and your portfolio will last as long as you do. In a recent edition of the Journal of Financial Planning, Wade Pfau, professor at The American College re-visited the Trinity Study which appeared in the February 1998 issue of the Journal of the American Association of Individual Investors. One of the blackest holes at brokerage firms is their continued reluctance to review, update, and contradict any study that was valid during the greatest bull market in history which was an outlier, not a common occurrence. After all, it’s in the industry’s best interest to perpetuate the myth that stocks are a panacea regardless of cycles. Academics like Wade Pfau are leaders of the “be someone” movement and his work is crucial to your financial success in retirement. The Trinity Study was published in 1998. The focus of the analysis was to determine the probability of portfolio success upon withdrawing 4% annually (adjusted for inflation), with a mix of long-term corporate bonds and the S&P 500 stock index. With a 50/50 asset allocation, the portfolio survived in 95% of historical rolling 30-year periods. Per Wade Pfau, who updated the study in the August 2015 edition of the Journal of Financial Planning, today’s markets matter more to the sustainability of portfolio survival than historical outcomes. Based on the current low interest rate environment and high stock market valuations, a sustainable 4% withdrawal rate will require a drawdown of principal. Income generated will not be enough. For new retirees this is especially dangerous as the first 10 years of portfolio withdrawals can alter permanently future portfolio longevity. If a retiree faces sequence of return risk whereby asset returns are below historical averages in the face of withdrawals that reduce principal, then portfolio success rates must be revised downward. The outcome of the study is sobering: Wade Pfau’s simulations conclude that a portfolio with a 50% stock allocation now has a 64% probability of success with a 4% withdrawal rate, down from 95%. Success is reduced to 37% at a 5% rate. Retirees must stay vigilant and examine portfolio withdrawals to be a step ahead of sequence-of-return risk. If portfolio distributions exceed income and appreciation for two consecutive years, withdrawal rates should be reduced for the upcoming period. It’s an exercise that should be conducted once a full year’s worth of liquidations are completed. Be One: Retirees experience happiness when giving back to their communities. Schedule a couple of hours a week to explore a charitable passion. Serving others provides great reward for all involved. For greater fulfillment, a donation of time over money is healthier. From there, you can gather a deep understanding of how your non-profits of interest, operate. Written reviews by those who have donated and others who sought aid, are there to assist volunteers make informed charitable decisions. I don’t know how the Houston “battle of the graffiti” will conclude. Regardless, there are many ways to be “one” and “someone” in retirement. They can co-exist. Form a synergy. In retrospect, “be both,” works. This entry was posted in Uncategorized and tagged financial planning, Houston, retirement, Retirement income, retirement planning, Trinity Study by Richard M. Rosso, CFP. Bookmark the permalink.